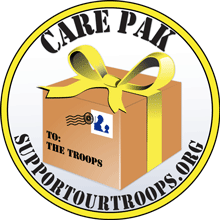 Support Our Troops® Care Packages enhance the morale and well-being of the deployed troops worldwide by seeking, receiving, and shipping care boxes containing items specifically requested by them. This is especially important outside the established holidays. 1. $25 GIFT CARDS ARE THE MOST NEEDED ITEM. This is how they get on the satellite for personal communications to home. $25 gift cards like Visa, Mastercard and American Express. Not store cards. 2. SEND BOXES WITH ALL THE SAME TYPE OF GOODS. Not assorted goods. Do not think in terms of preparing an individual box of assorted goods for individual soldiers. The military ends up re-sorting those at their end. It is waste effort at both ends. The present manner of distribution in the war zones and areas of conflict has care goods maintained in blocks of the same types of goods, so that soldiers can get exactly how much of what they want, and nothing goes to waste. you can donate via our donation page to help us distribute the goods to the troops. Your donation and support helps America’s troops do their jobs effectively. Nothing less than the best for these first class people! All first class, brand new, unopened, safety-sealed goods for America's finest. Include your name, address, email address, and phone number in case we need to get hold of you about the shipment. Also, be sure your name, address and phone appear legibly on the outside of the box. Include a printout of a digital picture of your group, school and class, and any notes about why you are sending the care package so the troops can know how much the folks here really love, respect, and appreciate them. We want the troops and their families to know whom, way back here at home, is thinking about them. Include $20 to Support Our Troops, Inc. for each box you send. Some weeks we hit $20,000 in shipping costs! You can include one total check of money order for the entire numbers of boxes. Cards, letters, and the like need to be unsealed and ready for inspection. NOTICE: Sending SOT care goods that aren’t packed right ruins everything in the box. You must double-bag individual liquid and gel items. Soap has to be bagged or it ruins the taste of the food items. Boxes arrive to SOT daily where they have leaked and ruined the other goods. Just imagine what happens in the war zone when they sometimes get dumped out of a hovering chopper. Laundry PODS packed in a sturdy plastic or metal container. Liquid creamers in little plastic cups with a foil top packed in a sturdy plastic or metal container. Care Packages Make a Huge Morale and Effectiveness Difference! How to Send Care Packs to Us. Use UPS, FedEx Ground, or Post Office parcel post. Be sure your name, address and phone number is on the outside of each box. Be sure to include $20 to Support Our Troops, Inc. for each box sent. Some weeks we hit $20,000 in shipping costs! 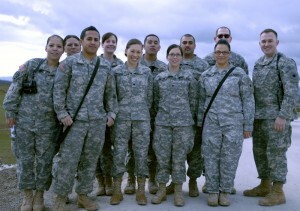 "Thank you for your thoughtfulness to the needs of our troops. The kindness you have shown makes a difference in the day-to-day lives of our service members. God Bless you, and please keep up with the things you are doing." "Thank you, Thank you, and Thank you so very much for the packages we received. We, the 2025th Transportation Company want you to know how appreciative we are for the phone cards, games, magazines, books, music CD's , DVD's, toiletries, the food and all the other goodies that were sent to us yesterday. Major H---- was overwhelmed with the packages that came in and he right away distributed the goodies to all the soldiers. It is a hard road for us over here especially during the holiday season. Being away from our families is really tough but with the goodies and gifts it made everyone feel like getting into the holiday spirit. From the 2025th Transportation Company Family we would like to extend our heartfelt "Thank You" for all of your support. We will always have a place in our heart for you. Thank you." "I would like to send you the thank you's from the whole D Co 1-130th ARB for the box you sent to us. It was a very uplifting gift in these times. We deeply appreciate your support as we carry on our mission. Recent events such the failed attempt against our nation in Detroit remind us that we do serve a purpose in these often uncertain times. Once again, thank you much for your support." ~~SPC Christian D-----, D Co 1-130th, Basrah, Iraq.